Today’s lesson in the Online Card Class Holiday Style is about Classic and Elegant. I love the look especially for Christmas Cards and Wedding Cards. I do believe that it is a style that is not that easy to achieve. Too little glam and it looks underdone and childish…………but too much glam often looks like ………..well………..too much and overdone. I didn’t like my card at first. I had the tree in the middle and it looked lonely and lost. Then I did some card surgery and I was quite happy with the transformation. Smug…………might be a better description of how I felt………………………then I added the card to my card base………………………upside down…………..twice. Karma really is a %^&*(! Anyway, I was able to save it by virtue of the fact the striped layer is acetate and did not disintegrate when I had to pull it off………..twice…………………..guess I am still not over it. 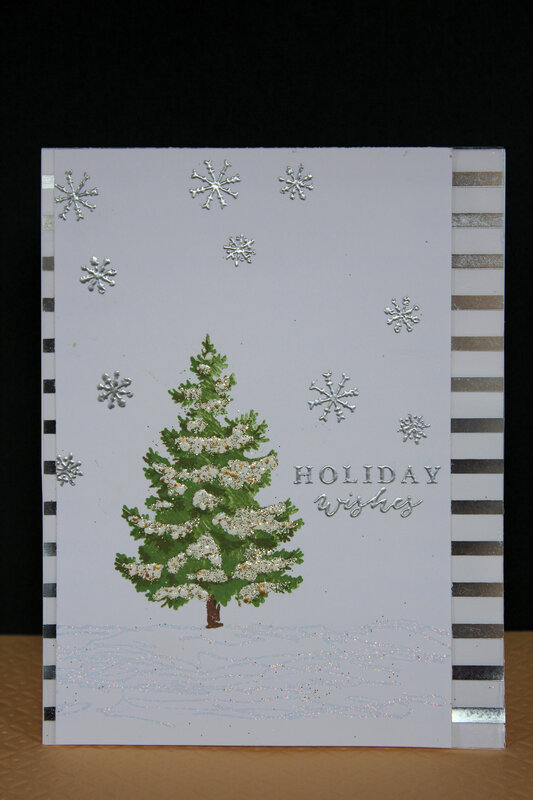 Posted on November 11, 2015, in Card Samples, Deb's (Oscar's) class samples, Oscar's (Deb's) Card Samples and tagged embossing, Hero Arts, Online Card class, WeR. Bookmark the permalink. 1 Comment.